How Dr. Dressler’s Apocaps apoptogen nutritional support supplement for dogs helps boost the immune system and enhance life quality. How mushroom therapy helps boost immune system when your dog or cat has cancer. 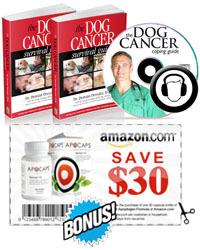 Help promote dog health with immune support supplements and cancer-fighting ingredients through Dog Cancer Vet Apocaps and EverPup natural supplement coupon sale on Amazon.